Nearly 81% of 2.25 million Catalans who participated in a simulated referendum Sunday said they wanted autonomy from Spain, according to preliminary results cited by the Financial Times and other news outlets. Catalan Deputy First Minister Joana Ortega announced the results of the vote on Monday morning at 12:30 a.m. with just over 88% of the returns in from polling stations. 80.72% of Catalans voted yes-yes to a two-part question asking if they wanted Catalonia to be a state and if they wanted that state to be autonomous. 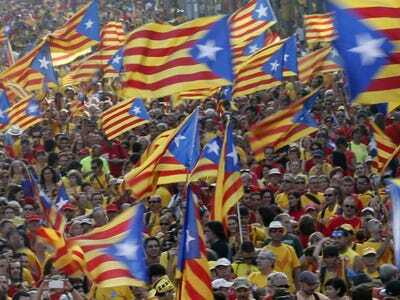 However, anti-independence groups boycotted the referendum and therefore skewed the results toward independence, according to the FT.
Catalans have wanted independence from Spain for quite some time, but this was the first time they formally voted on it, according to the Los Angeles Times. A lot of Catalans suffered after Spain’s civil war of 1936-1939 and, in more recent years, wealthy Catalans resented subsidizing the poorer regions of the country, according to the Times. The so-called consultation of citizens on Sunday came after the central government blocked a more formal ballot, NBC News reported. Pro-independence groups have campaigned heavily even though the vote was merely symbolic. They hope the Catalans’ support for independence may persuade Madrid to allow an official referendum in the future, according to NBC News.